The most compact,portable,and battery operated scale,the PS-5700 delivers a quick and accurate weight. The PS-5700 is extremely durable yet surprisingly lightweight. 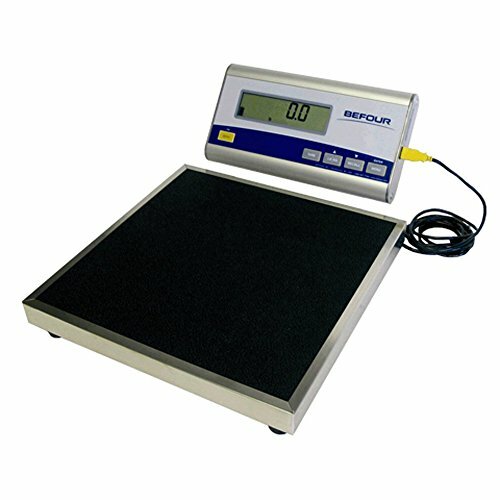 The 13" x 13" scale platform weighs only 8 lbs. and has an incredible 500 lb. weight capacity. As the top-selling national brand in team sports,Befour weigh-in scales combine accuracy,reliability and durability in a truly portable design. A clear choice for athletic trainers,home health care professionals,weight-loss clinics,and sporting events such as wrestling,martial arts,football and more. Its efficient LCD console provides battery life of an incredible 2+ years (over 80,000 weight readings) on a single set of alkaline batteries (included). With no moving parts,the PS-5700 is virtually maintenance-free and will stay calibrated under normal use. However,the innovative push-button calibration feature,if needed,makes calibration a "snap." Leave the tools at home! Other features include programmable tare,MotionLock Technology,and weight recall. Durable, lightweight, mobile platform with an anti-skid mat. If you have any questions about this product by Befour, contact us by completing and submitting the form below. If you are looking for a specif part number, please include it with your message.